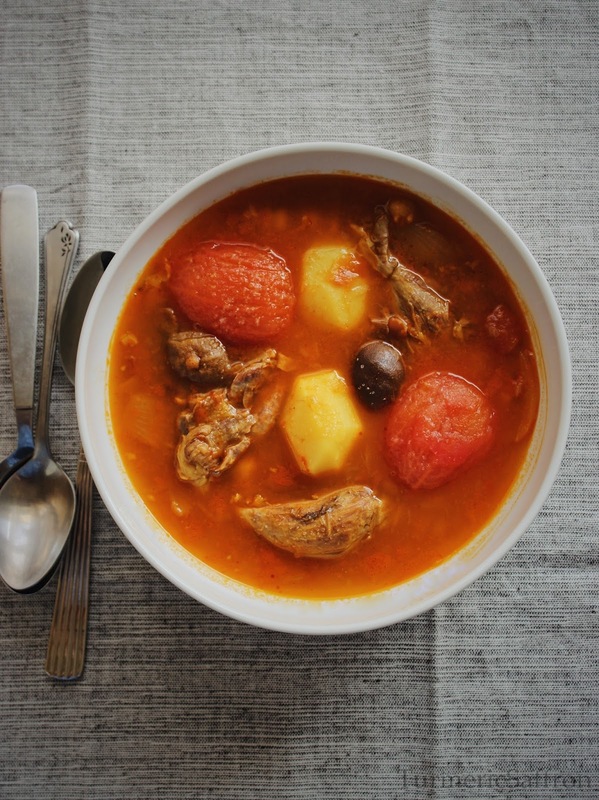 آبگوشت Abgousht/abgoosht is a hearty and filling traditional Iranian lamb soup. Abgousht will help you stay warm during the winter but you can make it all year round. 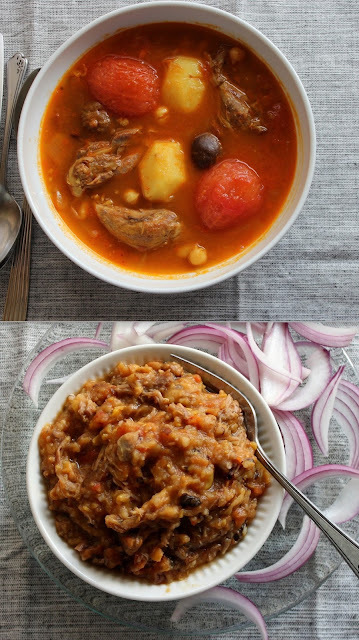 Abgousht consists of two delicious meals in one. The main dish is the soup itself and the side dish, گوشت کوبیده goosht koobideh (mashed meat), is all the ingredients in the soup that get mashed together. This is the dish that my mother would tell me I should make on weekends to share with family and friends. This recipe was passed down from my mother to me. You can also make abgousht in a pressure cooker or a crock-pot. A different version of abgousht is made with herbs and black-eyed peas and it's called Bozbash. In a large pot bring 8 cups of water to a gentle boil over medium heat. Add the turmeric powder, Gently place the lamb shanks in the water. In a small skillet, heat one tablespoon of vegetable oil over medium heat. Add the tomato paste, fry for 2-3 minutes until it changes color, stirring frequently. Add the tomato paste to the pot along with the onions, chickpeas, beans, tomatoes, dried lime, salt and pepper. Cover and cook for an hour over medium-low heat. Add the potatoes and cinnamon. Add more water if needed. Cook for another 45 minutes or until meat is fully cooked and tender. Remove any bones before serving and pass the soup through a colander. Pour the soup into a large serving bowl. Add a couple of tablespoons of the beans, meat and potatoes back to the soup and return the rest of the ingredients into a mixing bowl. Use a wooden masher or potato masher and mash the ingredients until smooth. Serve hot with warm bead, fresh herbs, torshi and seer torshi. Sounds delicious! I would like to try making it some day. Thanks for sharing. My husband is Iranian and I have eaten abgousht once and loved it. 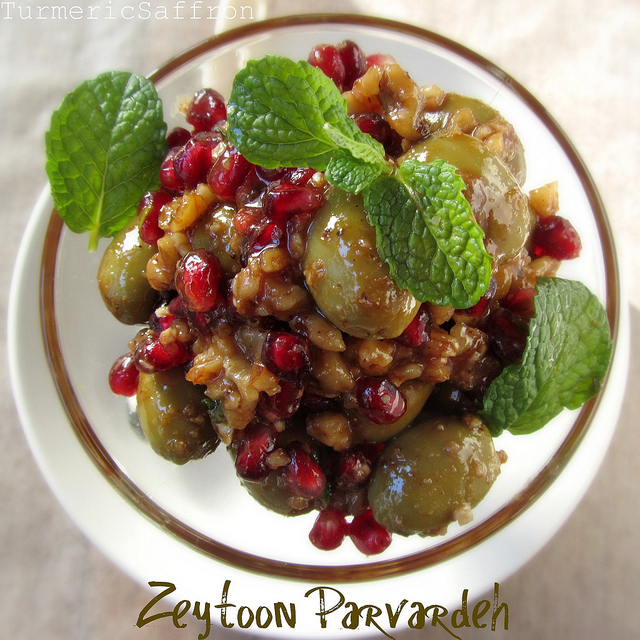 I can cook most iraninan dishes and im gonna try this for lunch tomorrow. Looks most like the one i had as other recipes on the web even include chilli paste, I know thats not right! Do you mash up the limoo-amani with the rest, or do you take them out with the bones? Thank you! Yes, I mash up the limoo-amani with the rest. Is there a specific way to eat the goosht koobideh with the abgousht? Like making sandwiches with the goosht koobideh and dipping it in the abgoushst? Or just eating them side by side? There is no specific way to eat goosht koobideh. You can make small bites/sandwiches and eat alongside the abgousht.